In order to assess the progress of the implementation of the civilian security sector reform and evaluate the level of the citizens´ trust into the process, the EUAM Regional Outreach Team visited Odessa at the end of March 2015. A variety of meetings discussing the local priorities and obstacles in light of the reform endeavor were held with senior interlocutors from government institutions, the police, prosecution, judicial administration, MFA, international organizations and local NGOs. 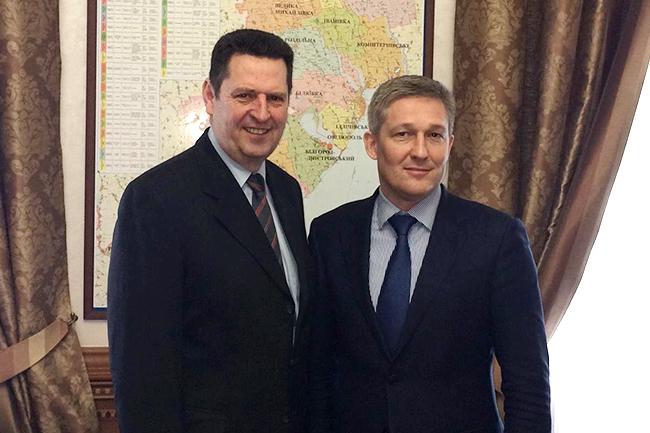 Among others EUAM met with Vladimir Kulakov, Deputy Governor of the Odessa Region, Ivan Katerinchuk, Head of the Odessa Police, Anatolii Orlovsky, Deputy Mayor, Vitaly Etnarovich, A/Head of the General Prosecutor´s Office Odessa, Kostantyn Rzehepishevskyy, Head of MFA Office, Valentyna Kiptyk, Deputy Head of Department for Judicial Administration in the MoJ, Alexandra Khoudokormoff, Head of OHCHR Odessa, Timothy Boucher, Team Leader OSCE Odessa.